"IFD System": the special automatic milk froth dispenser patented by De'Longhi. It combines milk, steam and air dispensing a cascade of frothy milk directly into the cup. Milk can be topped-up at any time. Removable milk reservoir for easy cleaning. Patented safety cap to prevent accidental opening. Adjustable steam emission. "Vario System" to select the desired coffee: from light to strong. Capacity: up to 4 cups of coffee. 2-cup adaptor to pour coffee directly into the cups. Heat-resistant glass jug. On/off switch with indicator light. Removable drip tray for easy cleaning. Capacity: up to 4 cups of coffee. 2-cup adaptor to pour coffee directly into the cups. Removable drip tray for easy cleaning. View More In Espresso Machines. 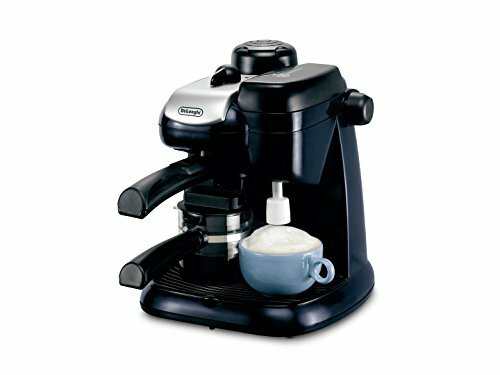 If you have any questions about this product by Delonghi, contact us by completing and submitting the form below. If you are looking for a specif part number, please include it with your message.